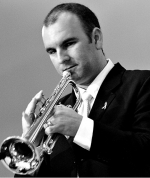 Ken Edwards, trumpet and flugelhorn player, is an active freelance musician and educator in the Dallas/Fort Worth area and currently teaches applied trumpet, jazz improvisation and jazz appreciation and directs one of the two large jazz ensembles at the University of Texas at Arlington.Ken was a featured soloist while on tour with the legendary jazz trumpeter, Maynard Ferguson, and played on Ferguson’s final studio album, The One and Only (MF Music). He was also a member and featured soloist in the world-renown One Oclock Lab band for two years. Beginning his musical journey as a freshman at Myrtle Beach high school under the direction of the late Dale Hair, Ken was encouraged to play the tuba and later learned trombone in order to be a part of the after school jazz program. Moving to Lewisville, TX, at the beginning of his junior year in high school, Ken continued to play tuba and trombone in the school ensembles. After graduation, he entered the Navy under a two-year program and began learning the trumpet in his off time. After the completion of his duties, he began his applied studies in trumpet with Dr. Rick Bogard at the University of Texas at Arlington where he earned his B.M. in Music immediately followed by The University of North Texas where he earned his M.M. in Jazz Performance and continued his studies in jazz trumpet with Jay Saunders and Mike Steinel. Ken’s first solo recording titled Lost In This Place (Armored Records) was released in 2007 and introduced seven original compositions which also featured Stockton Helbing and Brian Mulholland. Ken has shared the stage with many well-known artists, such as Joe Lovano, Vincent Herring, Byron Stripling, Lew Soloff, Gladys Knight and recorded alongside Wayne Bergeron, Clay Jenkins, David Braid, Chip McNeill and Steve Wiest. Ken has also recorded as a sideman with Stockton Helbing, Brian Mulholland, the UNT One O’clock Lab Band, Dan Bruce, Kris Berg, The Dallas Jazz Orchestra and Mark Tonelli, to name a few.